Beauty: 4.5/5 for breath-taking views and sheer mountainous magnificence. 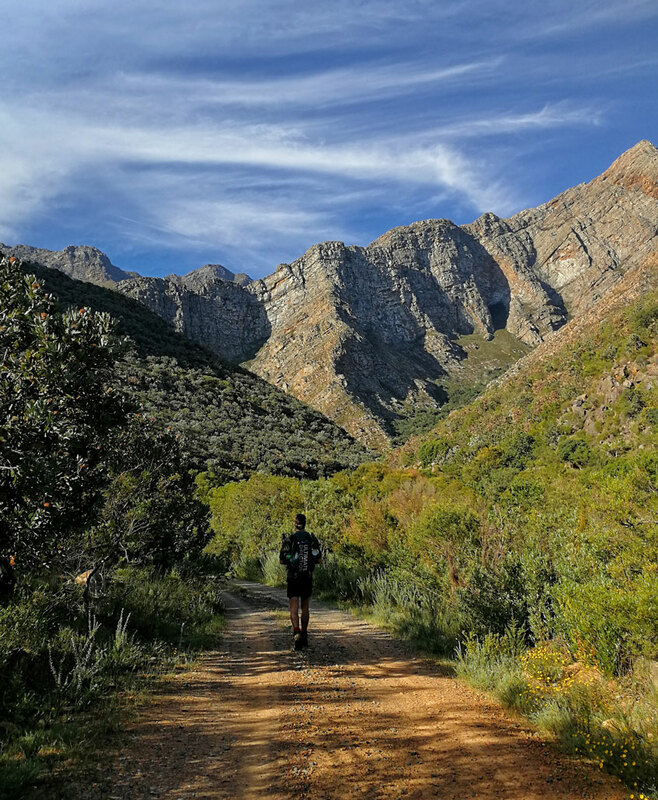 Difficulty rating: 9.5/10: Possibly the roughest terrain in the Western Cape with reasonably long distances per day and steep ascents and descents. 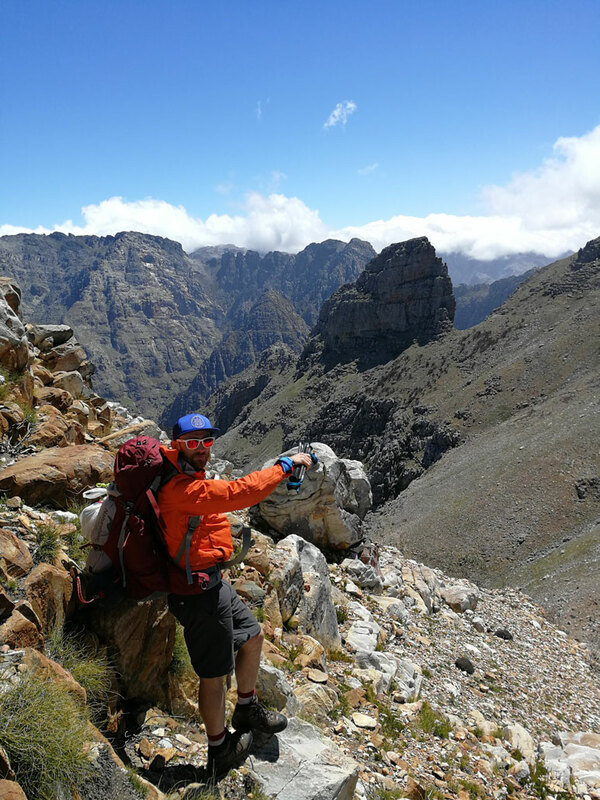 Technical rating: This route contains technical scrambling, big scree fields, off-trail/wilderness navigation and extremely volatile weather. It has claimed lives and should not be underestimated. 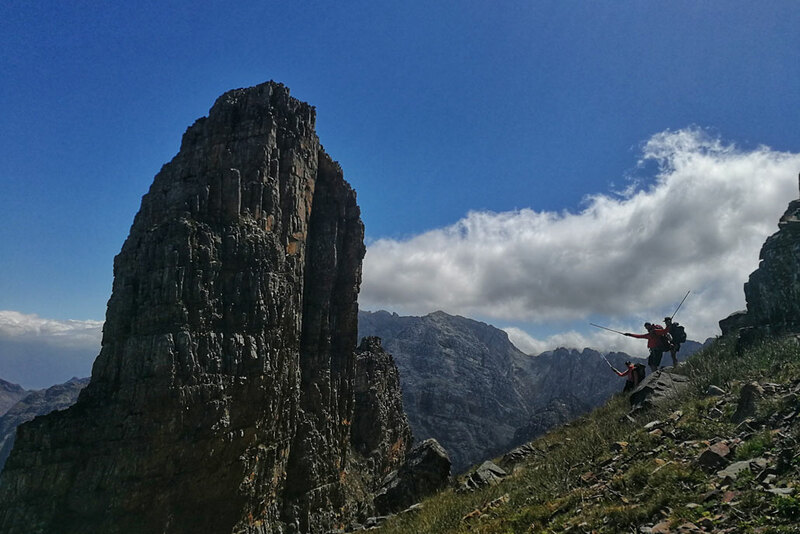 The classic Hex Traverse, from Thomas Hut to Pells Hut, forms part of the longer (8-day) full Hex Traverse across the second highest mountain range in the Western Cape. 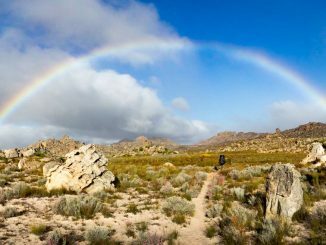 If our experience was anything to go by, it is easy to understand why the 2 or 3-day version is more commonly referred to as the Hex Traverse – not many are brave enough to have attempted the full traverse. 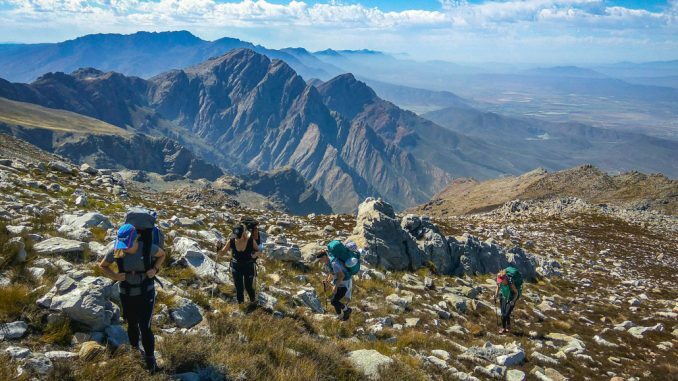 The typical start of the Hex Traverse is through the gates of Fairy Glen Private Nature Reserve, and most hikers will head towards Thomas Hut (Mountain Club of South Africa) to overnight. At Fairy Glen, you will need to register your car and sign in, before driving through the reserve and passing numerous wildlife, including lions. It is best to have a good idea where to start, as the road leading to the parking area extends in two directions. 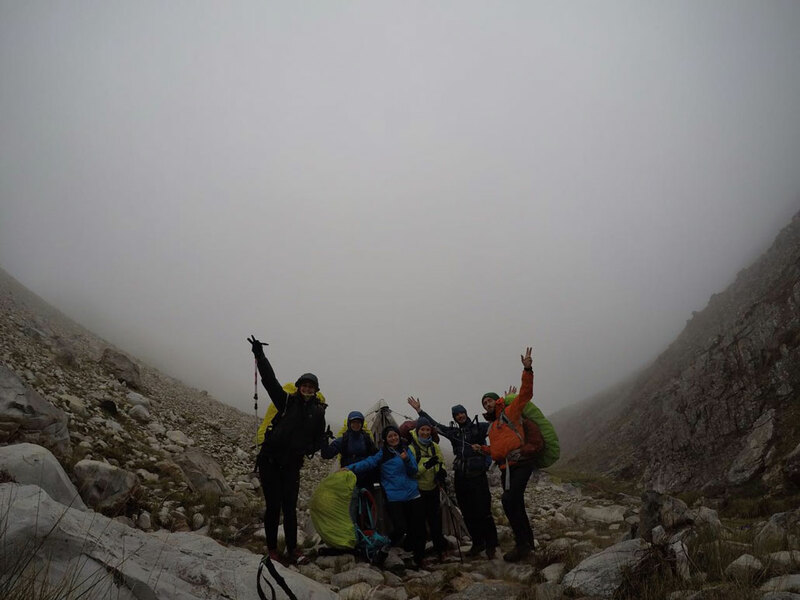 Our start, although cheerful, was in the wrong direction, and cost us a bit of a delay due to the limited daylight hours left to hike in – not that this was an issue for our resolute team! 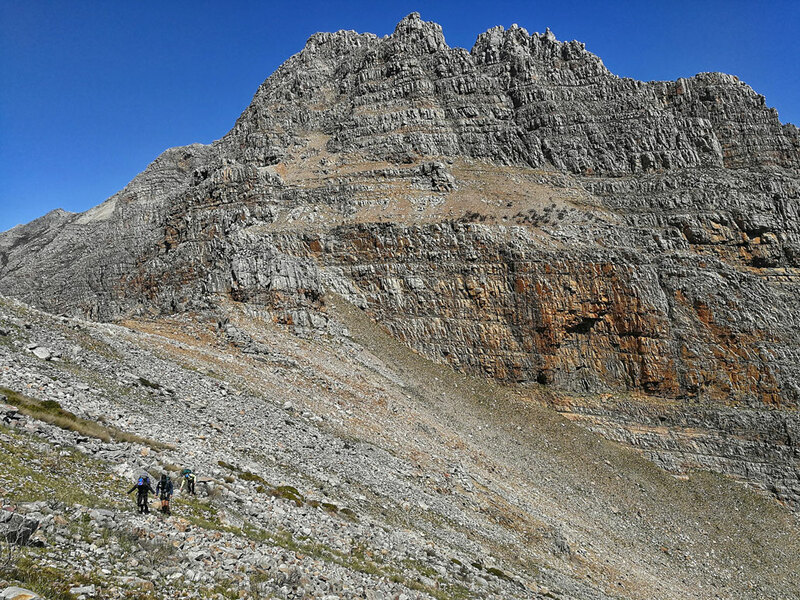 The path to Thomas Hut starts at about 445m above sea level, with the hut sitting at 1395m above sea level – needless to say, the path heads one way (UP!) through beautiful, lush, fynbos covered slopes. As one ascends, the views are incredible, and our team was lucky enough to have clear views across the valley all the way to the Hex River Valley, with the setting sun casting a coral glow onto the stacked features of the surrounding mountains and the low roars of the lions in the valley down below echoing up towards us. 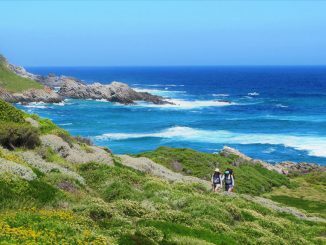 We reached Thomas Hut in the dark, in a satisfactory medium-to-slow pace time of 3.5 hours – and while still hot from the hike up, ran to the nearby rockpools for a quick (very quick), ice-cold dip. We awoke to mild and sunny weather, and took a slow, steady start upwards to Fonteintjiesberg. 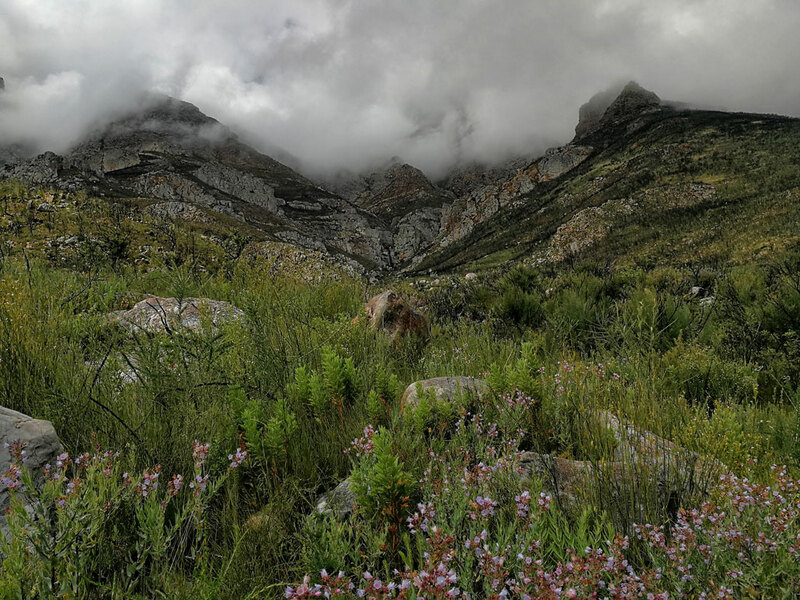 By the time we reached the plateau and were headed towards the beacon at the high point atop Fonteintjiesberg, we could see thick clouds rolling in, hugging the jagged peaks below us. We stopped for a quick refuel, taking in the breathtaking views east towards the Matroosberg mountain catchment area. Then, the real fun began. We began to descend, taking care with every step we placed because of the loose scree and rocks underfoot. 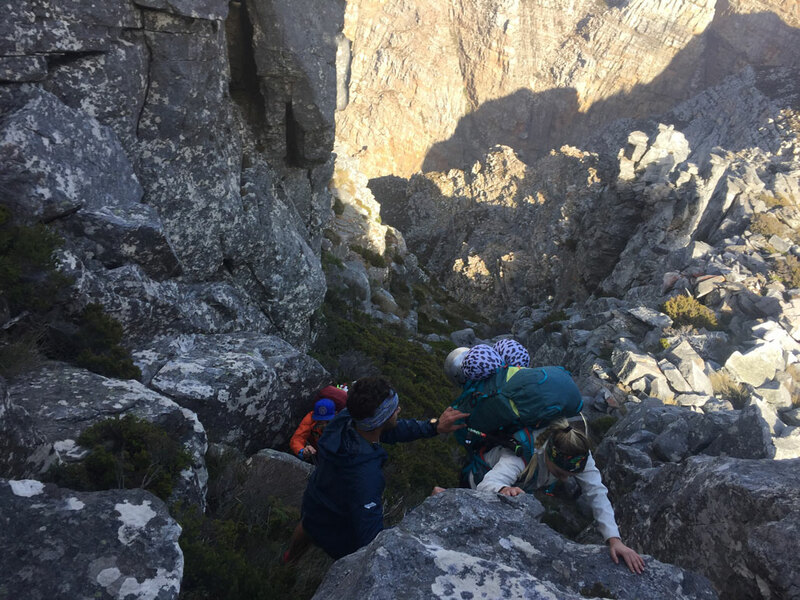 The descent was treacherous to say the least, and the trail was almost non-existent – cairns began to melt into the surrounding landscape, and the downward scramble required full concentration. But we could see our lunchtime goal in plain sight – the so-called Woolworths building looming closer and more impressive as we closed in across the divide on our scrambled-legs. However, reaching the Woolworths building was a serious anti-climax. After stumbling across a gnarly slope of scree, we arrived to realise that our hallowed lunchtime spot was in the direct line of fire of some serious updrafts – the wind was violent and it was cold. We pushed on and eventually rounded a corner where we could snack in more-or-less protected peace, while overlooking the Witels ravine. Here, the sheer scale of the mountains we were in was apparent, and we ate in breathless wonder. 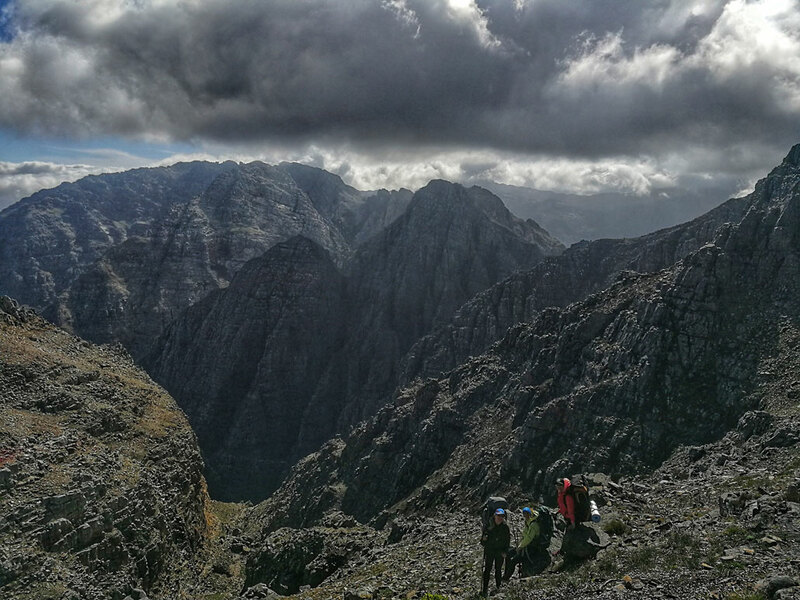 With the dramatic cloud cover closing in, and the serrated peaks jabbing into the darkening skies above us, I couldn’t help but feel as if we were in the middle of mythical Mordor – and liken our little team to the merry hobbits tackling some fateful journey. With our gallant scout Stefan searching for cairns, and our intrepid guide Stuart measuring each step against the GPS tracker, we continued on our way. 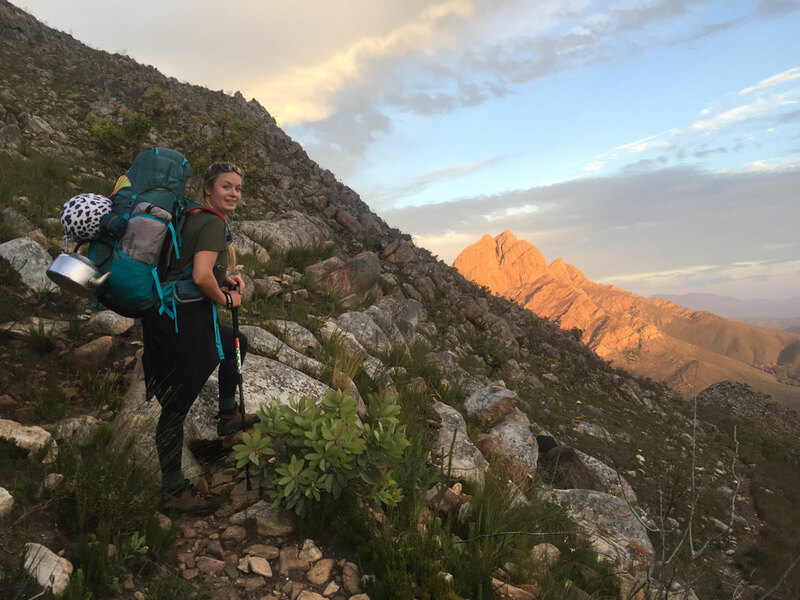 Traversing ridge lines in howling winds, and tackling slippery, steep and seemingly impossible scrambles, we steadily ascended and then descended Mount Brodie, knowing that we were drawing near to our rest point for that evening – the tiny, but life-saving Perry Refuge. We arrived just before sunset. Spirits were high, but so was the wind and we knew that with it, some serious weather was to be expected on the morrow. 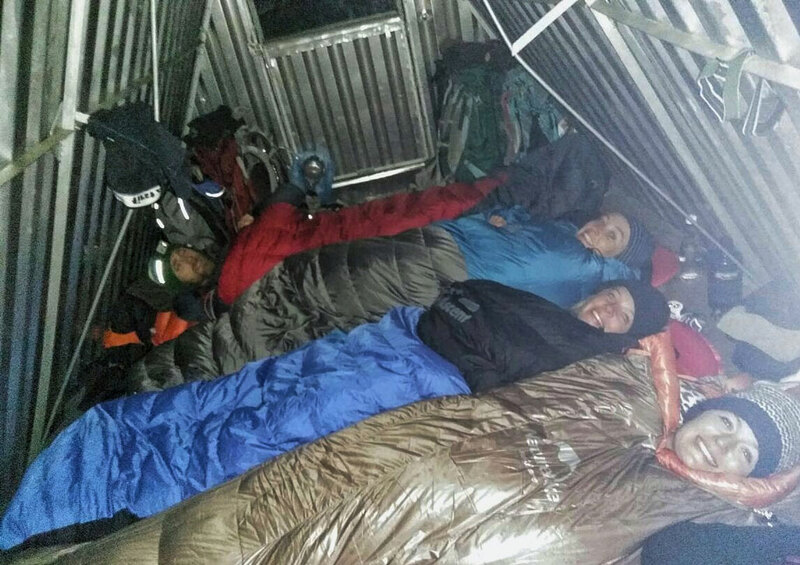 We crowded into the minute shelter, prepared a quick pasta for supper, then battened the hatches down and like a tin of sardines, jammed into our sleeping bags and spooning positions (a very calculated affair considering night-time ablution needs). In the morning, we woke early to catch the sunrise…and realized instantly that there was to be no sunrise. Surrounded by thick mist and a raging, frigid wind, we had to make a decision fast – stay inside Perry Refuge on limited rations and wait the weather out (perhaps for days), or take the gap before the predicted rain and possible snow arrived and get out as quickly as possible. We took the gap, and packed up as quickly as possible. Thus started a day of pure slog. 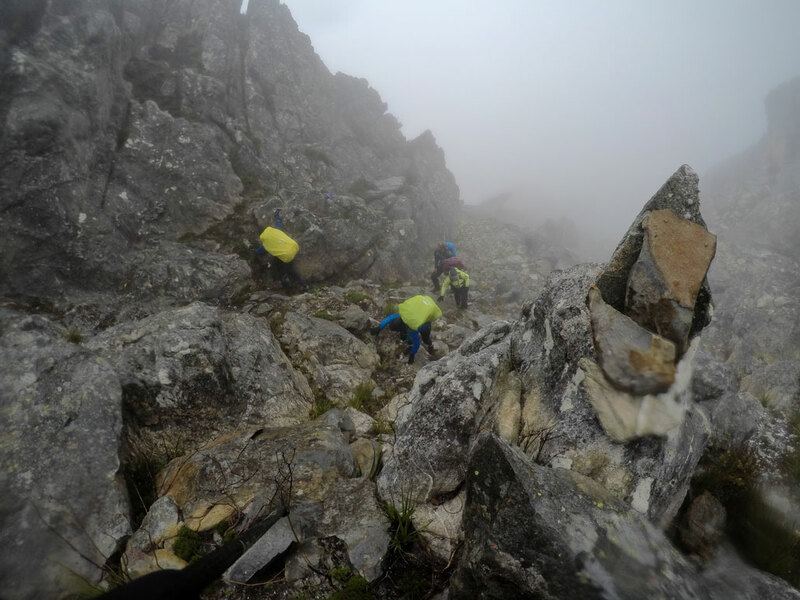 Nerves were frayed, navigation was difficult, markers were hidden under dense clouds, and the terrain was unbelievably technical – a jumble of rocks ranging from small ankle twisters to large knee-knocking boulders that extended in every direction. There was no trail to speak of. Hoods were up and heads were down; conversation was virtually non-existent and one had to shout to be heard above the gale-force winds if you wanted to make the effort (No one wanted to make the effort). We lost the route a couple of times, but after scrambling up a particularly steep and difficult ravine (classified on a scale of the severity of curse words used to power ourselves up the vertical rock faces), we managed to pick up the trail and stay on it. And just then, the skies opened and a hard rain began to fall, driven in every direction by the wind. Despite having heavy-duty gear, it wasn’t long before shoes and gloves were soaked through and raindrops were blurring our eyesight, making our journey all the more harrowing. It was at this stage, approximately, that batteries began to fail – both electronic and human. One of our team became borderline hypothermic, and while each of us put on a brave face, the endeavor instantly became a catch-22 situation – we were exhausted, but couldn’t stop to rest for fear of growing ever colder. 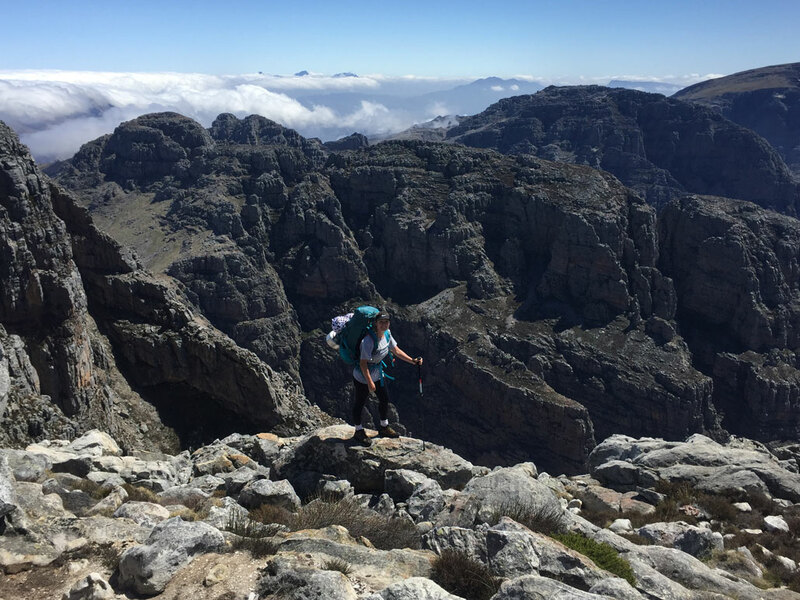 We pushed on, taking small bites of trail-food to keep going, and eventually reached the welcome sight of Pells Hut – the target that indicated the final descent. A 1400m descent down a ravine, much of it on the same route as a full and running waterfall (to be clear). 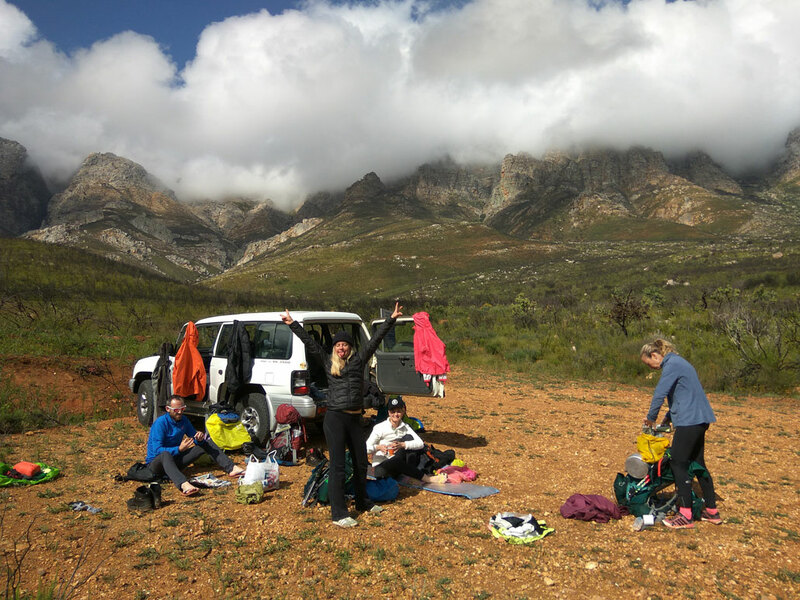 By the time we reached the car parked at the exit point, we were all in the hurt locker – cold, wet, tired, sore (and some of us with extremely creaky knees) – but elated. The Hex Traverse was done – we were broken, but had never felt more alive. That’s the funny thing with Type-2 Fun – it certainly brings one close enough to death to ensure absolute humility in revaluing your life, but earns one definite bragging points for later…indeed, the Hex Traverse is not for ants. Please contact the MCSA-CT section for more information. 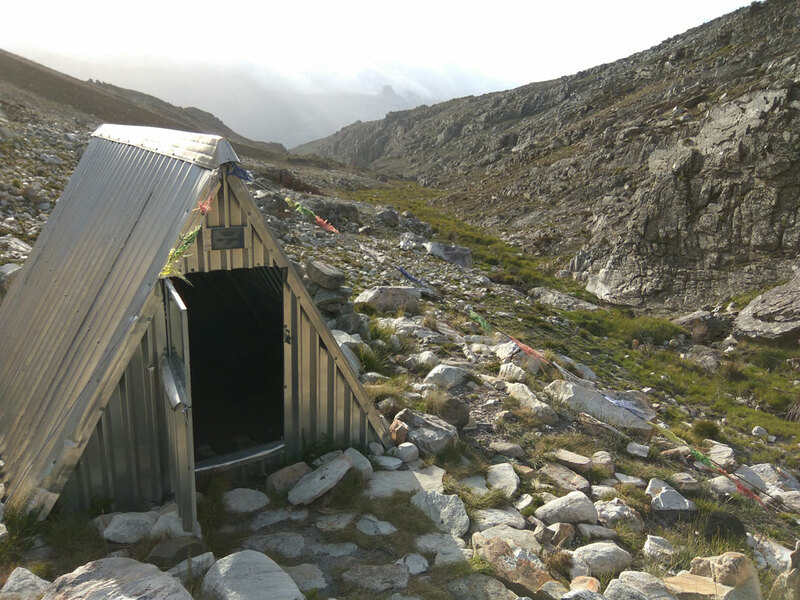 There are four huts in total that one can make use of, including the UCT Mountain & Ski Club owned Pells Hut and Hoare Hut (not en-route). You will need to make separate arrangements with both clubs to use the respective huts and to book permits as Zuurberg is on private land. There is little water en-route. However, both Thomas Hut and Perry Refuge have a nearby fresh water source that can be used in the wet months. It is recommended to carry between 1.5 and 2 litres per person per day. 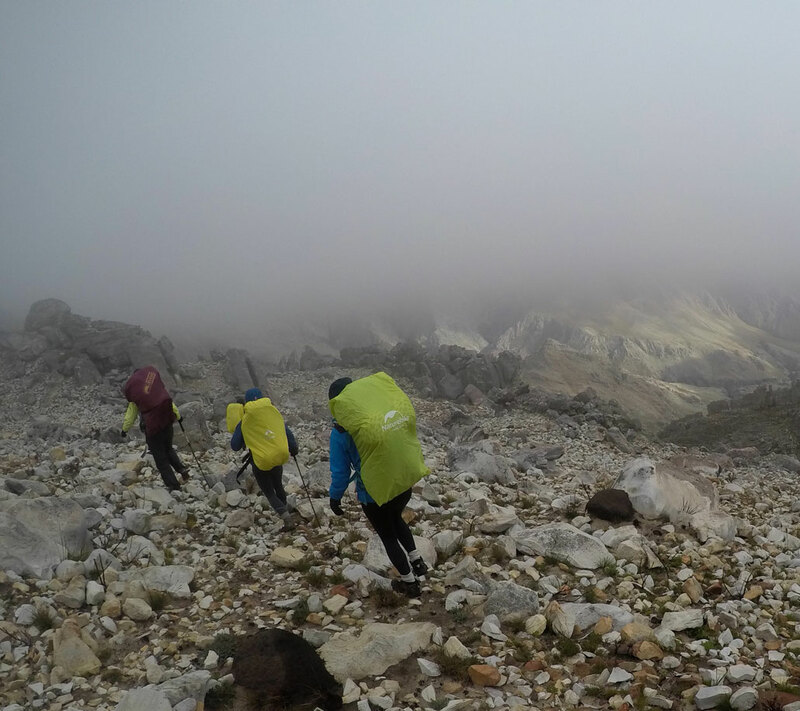 Include a mountain guide in your crew – this is not a clear trail, this is not an easy trail, and these mountains can have unpredictable and ferocious weather. 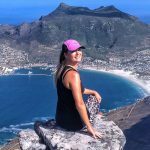 A qualified guide with the requisite navigation and mountaineering experience and skills is a non-negotiable, as is a working GPS tracker, sports tape (in case of a twisted ankle) and First Aid kit (must include tape for blisters and a space blanket). Make sure you have the right gear. But REALLY, the right gear. Pack light. No more than 12kg’s if you can help it. The scrambles require a lot of legwork, and if you are not strong enough to carry the extra pack weight either upwards or downwards, it can crush one’s spirit (best case scenario) and cause real problems or injury (worst case scenario). We all got out injury-free, but a heavier backpack than usual cost me dearly (in energy levels, optimism, tweaking knees, and post-Hex recovery time). Hiking boots with strong ankle support are critical. Hiking poles made a massive difference on the steep scrambles, as well as on the scree crossings for balance. If you have ANY doubts about your fitness levels or pre-existing injuries/medical conditions, the Hex Traverse is not for you. You will need to shuffle cars between the start and exit points on Day 1. Give yourself adequate time to do so (include an estimation for traffic delays), especially considering Fairy Glen usually allows the last car through at 4pm. Because of our late start time, we knew that we’d be arriving at Thomas Hut after dark, so pre-prepared dinner (butter chicken and rice) so that we could just warm it up upon arrival. What a win! What you carry in must come out with you – take zip lock bags for used toilet paper and extra packets for rubbish. Make sure you have a waterproof backpack, or a dry-bag to put all your crucial items into. I also did it recently, the same route, though we spent an extra night at Pells hut, and did the decent the next day. 2 of our party are trail runners & before the time had the idea of “scoping it out” for a possible future run. So there was much discussion along the way on the topic, and as we progressed there was more and more agreement that it just would not be possible. Then once back in civilization we came accross this account of what seems to be quite a spur-of-the-moment happy-go-lucky dash along our route in a little over 9 hours! It is an amazing route, I had a great (and grueling) experince. 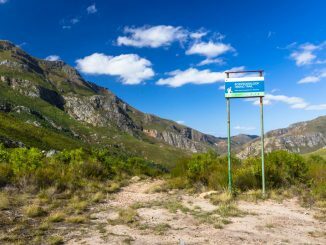 Hi Dania, Zuurberg is private property, owned by UCT’s Mountain and Ski Club. Please can you edit your article to state that members of the public need to contact UCT Sports Admin to get a permit to enter Zuurberg, in addition Pells Hut is also owned by UCT and is often used by other parties. Prior usage of the hut needs to be confirmed. Dear Andrew, thanks so much – hugely appreciate the information and the article has been updated accordingly. I have wanted to get up on the Zuurberg/ Waaihoek side for years, without success. This has just provided me with all I the info I need. Thanks a Million!